The article failed to normalise the pricing model so that a prospective purchaser could do a comparison between the different vendors offerings. They conflated the business models of pure virtual storage players (e.g. XDrive, Box.net), structured vendors (flickr, eSnips and Multiply), backup vendors (Mozy) and ISPs (GoDaddy). Virtual Storage Vendors: Virtual Storage vendors offer online disk space and price according to quota allocations. Their primary costs are related to spinning disks (see Nik Cubrilovic’s excellent analysis) which means power consumption, network bandwidth and collocation footprint and maintainance dominate the equation. Their revenue model is therefore strictly pay for use as it is hard to interject an advertising stream into a pipe of raw data. You can tell a Virtual Storage vendor by the fact that they will have a Storage Plan link somewhere on there front page, that details the rising scale of prices with increasing demand for storage. If virtual storage follows the model of local storage, reads will dominate over writes. Structured Storage Vendors: Structured storage vendors offer storage for a particular type of file (the most well known being flickr, but Glide is also a strong rising contender). They have a similar cost structure to their Virtual Storage companions but can augment their revenue with advertising. They therefore often use a Free+Premium model where the basic service is free and you pay for additional enhanced services. Bandwidth limits for free users are a useful model for these vendors as it allows them to easily predict future demand. Backup Vendors: Backup vendors are focussed on recovery from failure or deletion. They are in the insurance business and although most model their services like the virtual storage vendors their costs should in theory be substantially lower as in the backup model writes dominate over reads and these vendors should be able to utilise tape storage to dramatically reduce their data centre costs. I have produced a comparison table that splits the vendors along these lines using the TechCrunch list as a starting point and adding a list of Remote backup vendors culled from a number of websites on the net. 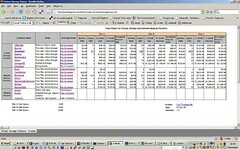 The table is split into three groups Virtual Storage Vendors, Remote Backup vendors and Sharing/Structured Storage Vendors. I have not done much analysis on the structured storage vendors as a I don’t see those guys as the focus of this study which is trying to determine what price virtual storage is likely to be. More work on the Sharing guys may follow. I’ve included three prototypical plans for 5, 10 and 20GB of storage. I should point out that even 20GB will barely store the average user’s music collection, never mind their photos. Yet, very few vendors (AllMyData is the notable exception) quote for disk space over the 50GB limit. I then map the vendor’s closest plan in each case and normalise the table to generate a comparsion column for 5, 10 and 20GB of storage. The data for 20GB is graphed on the graph tab for easy comparison. Virtual Storage parallels backup storage in price. The most expensive backup vendor (BackupCellar) is $500 more expensive per year that the most expensive Virtual Storage Vendor (iStorage). This shouldn’t be the case as backups storaged on tape have sub-cent prices per Gigabyte year compared to holding all the data online on a power hungry, failure prone spindle. The differential price between the mid-range and highest price vendors is over 75%. There is some serious price gouging going on here (yes I’m talking to you and you). The business Models are all identical. They all offer a storage plan and the concept of a remote disk. Only AllMyData has anything different to offer in terms of offering up storage on your local disk to reduce your cost of purchase. Their pricing is also so wildly out of line with the competition (in a good way) that you have to ask yourself if they might have made a miscalculation. Of course the likelihood is that Google is going to put most of these vendors to the sword when the launch (if they launch?) their GDrive product. Until then caveat emptor, it pays to shop around. This is a really good piece of work, and definitely an imporovement on our post.